Recipe by: Nancy Ann R.
"My husband fondly recalls the Anise Bread that his Italian grandmother used to make during the holidays. She evidently never had a recipe (and never used a bread machine!) so this is what I came up with for a quick, special Christmas bread. This rich bread has a wonderful aroma while baking." Spread hazelnuts evenly on a baking sheet. Bake until lightly toasted, about 5 to 7 minutes. Remove the pan from the oven, transfer the nuts to a bowl, and let them cool. Place the eggnog, sugar, salt, butter, egg, egg yolk, bread flour, yeast, anise seed, and cinnamon into the bread machine. Program the machine for a basic cycle with the crust as "medium." Press start. Do not use the delay timer. Place the cooled toasted hazelnuts into the machine between Knead Cycle 1 and Knead Cycle 2. When the baking cycle ends, immediately remove the bread from the pan and allow it to cool on a rack. Prepare the glaze by combining the confectioners' sugar and eggnog in a bowl; mix well. It should be a drizzling consistency. Drizzle the glaze on the cooled bread before slicing. This bread is so delicious and easy to make. I was afraid the with 2 T. of anise seed it would be a bit too much spice but it turned out so good! I made this and it was amazing! A little bit challenging though for a novice baker like myself. Everyone loved this bread and the glaze was an extra special touch! I loved it warmed with honey butter! Amazing fresh out of the machine! The Glaze makes it. It didn't mention, but I slightly chopped the nuts with their skins on (I had trouble skinning them), all turned out well. Great taste, both of bread and of frosting! The bread texture is smooth, even with half of the flour as whole wheat. Great recipe! Great flavor. However, I took out the anise seeds and cinnamon, as I like neither. But oh so wonderful. 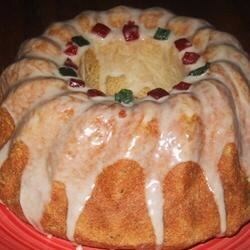 And don't forget the amazing eggnog glaze!